When children are young, they can learn self-control and how to plan ahead, which are skills needed for a strong financial foundation. As your child grows older, he or she will probably be increasingly exposed to advertising and peer influences. This makes a parent’s role essential in developing financial habits. We recently heard stories from parents that reinforce what our research shows: The preteen years are critical for developing an internal compass for what’s important and what’s not. Here are some examples of how children can learn important lessons from parents – even if they are just shopping for shoes. More and more, preteens are exposed to advertising and peer pressure. Parents can help by instilling values like frugality, thinking twice, and staying away from temptations. By asking a few questions, Jen’s father was able to figure out that the brand name wasn’t important to his daughter, which helped his daughter absorb an important lesson about value. Instead of just buying on impulse, Jen learned to take a step back and ask herself what she really wanted. So Tina went back to school in her sneakers armed with the information they had found, and proud to tell her classmates that her sneakers were just fine. With a timely intervention from her parents, Tina learned a valuable lesson about peer influence. During the preteen years, developmentally, it’s a little early for children to handle their own money decisions. Instead, it’s a great time for parents to intervene at key situations to talk about financial common sense. By encouraging preteens to ask themselves what they really want, or showing them how to do research to find facts, parents can help preteens create an internal yardstick to help them make their own decisions as they grow into adulthood. 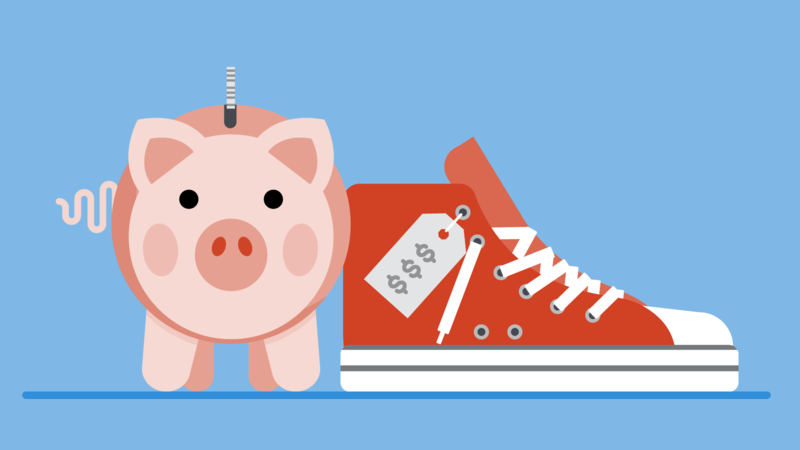 Being able to make decisions that make the most sense for them as individuals – and not just buying the trendiest thing even if it’s just about shoes, is a skill that will serve them well throughout their financial lives. For more ideas on teaching your kids about money, check out our resources for parents. Read a more detailed report we commissioned about the stages of development for children’s financial knowledge, attitudes, and skills. Have a young child? Review our blog for building nonfinancial skills to help your child’s financial development. Stay tuned for our next blog about how teenagers can benefit from experience-based and practical education programs. As your child gets older, parents and other adults who are constant in a child’s life remain influential. The names in this blog have been changed to protect the privacy of those involved.